In 1969 there had been a discovery of a roof tile, and a decade later in 1979 a small excavation was carried out (Graham 2004). Then in 1983, two metal-detector users discovered some silver and gold coins, which they reported to the museum in Guildford (Hobbs 2003: 143; Thomas 2009: 155). In England and Wales at that time, the legal procedure followed for such discoveries was treasure trove , a process through which a coroner’s inquest determined whether the objects put forward should be classed as ‘treasure’ in the legal sense (see Sparrow 1982 for a discussion of treasure trove). The events that followed have been described as ‘nothing short of a scandal’ (Faulkner 2003: 174). In the course of the inquest that took place the following year, the exact location of the site where the coins had been found was given out in open court (Hanworth 1995: 173), leading soon after to large scale nighthawking (looting with metal detectors) at the site (Gilchrist 2003; Hobbs 2003: 143; Sheldon 1995: 178; Thomas 2009: 155). Due to the illicit nature of the metal detecting and digging that took place in the ensuing days, it is not possible to know for certain how many individuals were involved. It has been said that dealers were also present on site, buying objects as they came out of the ground (Graham 2004: 307), and that there were perhaps, ‘at times, 30 or 40 people digging away overnight’ (Sheldon 1995: 178). In addition, articles in treasure hunting magazines seemingly inspired treasure hunters to come to Wanborough to participate in the apparently unrestrained plundering of the site from counties as far away as Norfolk, Kent and Dorset (Sheldon 1995: 178). It is also unclear how much material was removed from the site in that initial period of looting. Some estimates have suggested that more than 20,000 individual artefacts may have been removed, and certainly at least 9,000 (Stead 1998: 149). The artefacts found at Wanborough have included Iron Age and Roman coins (Hobbs 2003: 143), but also other material connected to the site’s function as a temple, including a sceptre and headdresses (Hammond 1997). It has been estimated that objects were looted with a total market value at the time of £2 million (Brodie et al. 2000: 22; Hanworth 1995: 173), however this can also only be an approximation in the absence of precise data. A small amount of material was seized during the 1984 looting incidents by police, but much went straight to the antiquities market – and has occasionally resurfaced since (Hobbs 2003: 143). Another unknown is the destination of much of the material; ‘Some of the coins have been reported in Belgium, Switzerland and Germany; others as far afield as New Zealand’ (Sheldon 1995: 178). Material is also believed to have gone into the US market (Hanworth 1995: 173). 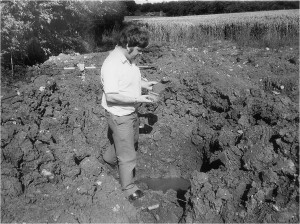 Further material was excavated during rescue excavations and surveys in 1986 carried out by the local voluntary group Surrey Archaeological Society, but even during this authorised fieldwork further illicit metal detecting took place (Graham and Graham 1986). Curiously too, in the same year some material that had been looted from Wanborough was sent anonymously to Surrey Archaeological Society, accompanied by a note from a ’well-wisher‘ (Thomas 2009: 155). A feature of the looting at Wanborough that makes it particularly notable, aside from the scale of the damage to the site, is the fact that arrests were made and cases even went to court (see Thomas 2009: 155-58 for an account of how the trials went). Despite a small number of convictions resulting in fines and confiscation of a metal detector (Thomas 2009: 155), it was widely acknowledged that the court cases actually demonstrated the need to change the Treasure Trove common law and pass new legislation that was fit for purpose (Addyman 2009: 61; Bland 2009: 63). Although it took another decade, the events at Wanborough, and the tenacity of Surrey Archaeological Society in particular, have been credited with providing the catalyst for what eventually became the Treasure Act 1996 – a new law replacing Treasure Trove in England, Wales and Northern Ireland. Wanborough itself, despite the scale of the looting in 1984, experienced further looting on later occasions, perhaps due to the ‘almost mythical status’ that the site had attained (Addyman 2001: 142). Specific incidents have been in reported in 1986 (see above), 1997 (Denison 1997; Hammond 1997), and in 2005 (Thomas 2009: 161). Addyman, Peter V (2001), ‘Antiquities without Archaeology in the United Kingdom’, in Neil Brodie, Jenny Doole, and Colin Renfrew (eds. ), Trade in illicit antiquities: the destruction of the world’s archaeological heritage (Cambridge: McDonald Institute for Archaeological Research), 141-44. — (2009), ‘Before the Portable Antiquities Scheme’, in Suzie Thomas and Peter G Stone (eds. ), Metal Detecting and Archaeology (Woodbridge: The Boydell Press), 51-62. Bland, Roger (2009), ‘The Development and Future of the Treasure Act and the Portable Antiquities Scheme’, in Suzie Thomas and Peter G Stone (eds. ), Metal Detecting and Archaeology (Woodbridge: The Boydell Press), 63-86. Brodie, Neil, Doole, Jenny, and Watson, Peter (2000), Stealing History: The Illicit Trade in Cultural Material, (Cambridge: The McDonald Institute for Archaeological Research, University of Cambridge). 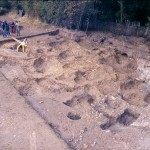 Denison, Simon (1997), ‘Wanborough looted’, British Archaeology, (24), http://www.archaeologyuk.org/ba/ba24/BA24NEWS.HTML, accessed 3 August 2012. Faulkner, Neil (2003), Hidden Treasure: Digging up Briatin’s Past (London: BBC Books). Gilchrist, Andrew (2003), ‘There’s gold in them there hills’, The Guardian, 17 September. Graham, David (2004), ‘To change the law: the story behind the Treasure Act 1996’, Surrey Archaeological Collections, 91, 307-14. Graham, David and Graham, Audrey (1986), ‘Unpublished report on metal detector survey at Green Lane, Wanborough’, (Surrey Archaeological Society). Hammond, Norman (1997), ‘Looters pillage Roman temple site in night raid’, The Times, 28 March, 1. Hanworth, Rosamond (1995), ‘Treasure Trove: New Approaches to Antiquities Legislation’, in Kathryn W Tubb (ed. ), Antiquities Trade or Betrayed: Legal, Ethical and Conservation Issues (London: Archetype), 173-75. Hobbs, Richard (2003), Treasure: Finding our Past (London: The British Museum Press). Sheldon, Harvey (1995), ‘The Lure of Loot: an example or two’, in Kathryn W Tubb (ed. ), Antiquities Trade or Betrayed: Legal, Ethical and Conservation Issues (London: Archetype), 176-80. Sparrow, Charles (1982), ‘Treasure trove: a lawyer’s view’, Antiquity, 56 (218), 199-202. Stead, Ian M (1998), The Salisbury Hoard (Stroud: Tempus). Thomas, Suzie (2009), ‘Wanborough Revisited: The Rights and Wrongs of Treasure Trove Law in England and Wales’, in Suzie Thomas and Peter G Stone (eds. ), Metal Detecting and Archaeology (Woodbridge: The Boydell Press), 153-66. Thomas, S. (2009), ‘Wanborough Revisited: The Rights and Wrongs of Treasure Trove Law in England and Wales’, in S. Thomas and P.G. Stone (eds. ), Metal Detecting and Archaeology (Woodbridge: The Boydell Press), 153-66. Thomas, S., and Stone, P.G. (eds.) (2009), Metal Detecting & Archaeology (Woodbridge: The Boydell Press).